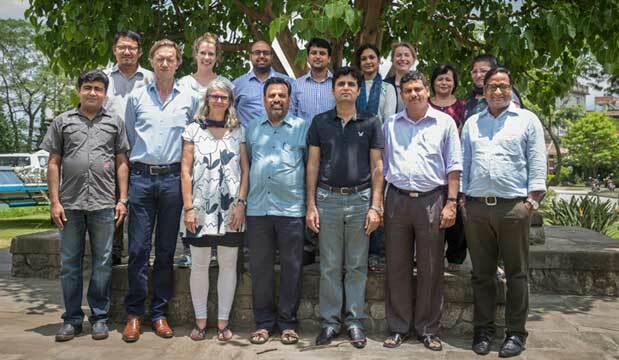 The HI-AWARE Consortium Research Management Team (CRMT) met at the ICIMOD Headquarters in Kathmandu, Nepal, from 1-3 July 2015, to review progress, and discuss the way forward. The CRMT members pose for a group photo outside the ICIMOD Headquarters in Kathmandu, Nepal. Dr Philippus Wester, Principal Investigator for HI-AWARE, outlined the agenda as well as the expected outcomes of the three-day meeting. Dr David Molden, Director General-ICIMOD and Chair of the HI-AWARE Steering Committee, in his welcome address, remarked that HI-AWARE had done a good job of bringing the partners together, and that they should now focus on showing results. He reminded everyone that HI-AWARE would be subjected to a mid-term review the following year. Dr KS Murali, Senior Programme Officer-IDRC, agreed that HI-AWARE had indeed shown a strong commitment to the initiative and that there has been good research done, but that it needed to “tease out” the details over the next three days. Dr Wester presented the consolidated HI-AWARE Annual Report covering the period March 2014-March 2015, which was well received. Dr Murali provided feedback on the Annual Report from the CARIAA perspective. He said the report captured the progress made very well, but that the partners needed to “zero in” on what they can do with and without additional CARIAA support as well as articulate their training needs. He said he would like to know more about the work done on cross-consortia research issues and lauded the team for their efforts to incorporate gender equity into the programme. He urged the partners to finish their allocated budget on time, as it is difficult to spend the remaining balance on the ‘soft part’ of the programme at the last minute. David Molden, Chair of the HI-AWARE Steering Committee, delivering a welcome address. The HI-AWARE consortium members next reported their progress. The reportage confirmed that progress has not been uniform – some members are on track, some are lagging behind. The members also mentioned that study and pilot intervention sites have been identified; situational analyses, undertaken to establish baselines for the HI-AWARE study sites, have been more or less completed. New methodologies on downscaling, climate modelling and piloting adaptation interventions have been co-developed and fine-tuned; and a reasonable number of papers – especially on downscaling, timing of water demand for double cropping, geophysical drivers of climate change vulnerability, and a food-energy-water nexus proposal – are in the pipeline. Also, work on migration and gender has been initiated. Between them, TERI, PARC and Alterra have engaged in or are in the process of engaging six PhD students in research. Equipment for heat monitoring purpose has been procured, sites selected for their installation, and fact sheets developed for heat measurement. Also, the HI-AWARE website and social media platforms (Twitter and Facebook), and the CARIAA KM Platform have been launched. Pilot work on flood-resilient and climate-resilient housing is being conceptualised for Teesta-Bangladesh and Upper Ganga, but after the Nepal earthquake, the focus has also shifted to earthquake resilience in addition to climate resilience, including piloting of a community-based flood early warning system for one of the communities in flood-prone Bihar. All agreed that they were meeting most of their individual objectives but that they needed to focus on generating robust evidence-based knowledge, if they are to make a dent on policy or/and practice. A HI-AWARE Partnership Health Check-Up Assessment was conducted (on the scale of 1 to 5, with ‘5’ being the highest score, and ‘1’ the lowest score) jointly, pertaining to criteria such as flexibility, equal voice/weight at the partnership table, attitudes and competencies, efficiency and effectiveness, and results and productivity. The overall health of the partnership was found to be ‘average’. The lowest average score corresponded to efficiency and effectiveness, which is worrisome. The partners then discussed what has worked well on the partnership front and what needs to change or be done differently. To enhance effectiveness and efficiency, it was proposed that there be improvements made in planning, coordination, and communication/response time, as well as to have more regular face-to-face meetings, exchange visits, and Skype video chats. Farid Ahmad, Head of the SPMU Unit at ICIMOD, facilitating a session at the CRMT workshop on Day 2. Is HI-AWARE on track and moving in the right direction? Are the governance and coordination mechanisms working properly at all levels? Is the research quality-control mechanism working well? Do earlier assumptions about meeting the programme objectives still hold? Lots of good suggestions were proposed by the breakout groups to address issues regarding the pace of HI-AWARE progress, governance, coordination, research quality and risks. Farid next gave a short presentation on the Theory of Change and Impact Pathways to underscore why HI-AWARE exists in the first place. He noted that that ‘research into use’ was very important for facilitating the uptake of research and pilot outcomes to inform policy and practice to enhance the climate change adaptive capacity and resilience of vulnerable populations in the four study basins – the Upper Ganga, Indus, Teesta and Gandaki. Dr Murali reminded all that IDRC-CARIAA expects HI-AWARE to come up with three additional pillars to support its ‘research into use’ component – a) stakeholders-engagement strategy, b) external knowledge management and communication strategy, and c) policy-and-practice engagement strategies by the end of this year. Anja Rasmussen, Senior Manager, Knowledge Management and Communications, ICIMOD, presented a research into use framework (see diagram) for uptake of evidence to inform policy and practice to achieve the HI-AWARE goals. Although cross-consortia activities would be guided by strategy and tools developed by CARIAA such as Knowledge Management and Communications Strategy, KM Platform, co-branding, and monitoring and evaluation, Anja agreed that HI-AWARE needed to develop its own consortium-specific external communication and outreach strategy to guide the development of tools and knowledge products to – a) raise awareness, b) engage with target audiences and stakeholders, and c) capture feedback for learning – at all levels, in order to contribute to the achievement of the HI-AWARE goals. Next, inputs to the following questions were solicited for drafting the HI-AWARE communication and outreach strategy – namely, who are our major stakeholders and target audiences, what are our priority areas for communication and outreach, and the types of messaging. The PI and Co-PIs nominated two HI-AWARE KMC focal points from each consortium member under the lead of Anja to develop and implement the HI-AWARE KMC strategy. Ujol Sherchan, ICIMOD KMC focal point for HI-AWARE, urged all the other KMC focal points to use the CARIAA KM Platform proactively for collaboration, internal document/information sharing, and for participating in cross-consortia thematic/country working groups. He also called on them to provide or develop content (news, blogs, events, etc) for the HI-AWARE website. He noted that the HI-AWARE Facebook Page and Twitter handle have been created – and that these would be centrally managed for the time being. He ended on a note that all these tools/channels should be seen as works-in-progress and called on all to continually provide feedback to improve their functionality and usage. Dr Arabinda Mishra, Work Package 2 (‘Research into Use’) Lead for HI-AWARE, presented lots of good ideas on Policy Engagement Strategy. He outlined a number of activities that can be taken up to engage with policymakers, who need not always be government agencies, such as seeking comments on draft policy documents, organising policy seminars/dialogues, doing policy advocacy through media, facilitating exposure visits for policymakers to pilot/demonstration sites to demonstrate alternatives, and also producing policy briefs. He said the overall goal of the policy engagement strategy should be to help policymakers and decision makers make informed decisions under uncertainty. As stakeholders have to be provided with opportunities to articulate their demand for knowledge and evidence, he noted that a stakeholder-engagement plan would also be needed to define entry points, and the key processes involved. He then broke the participants into three groups and called on each to propose ideas for engaging with policy and practice at three levels: local/subnational; national; and regional. Between them, the groups proposed many good ideas such as promoting ecological-sanitation (flood- resilient housing + sanitation) in parts of flood-prone Bihar; installing early warning systems for heat stress/spell in urban pockets in the plains; adopting policy instruments for upscaling solar pumps for irrigation in the Indus river basin; supporting skills and livelihood diversification in Upper Ganga and encouraging ground water recharge projects for revival of spring water in the Teesta river basin; ensuring that the international water-sharing treaty (e.g. between India and Bangladesh) includes climate change and livelihood concerns; and leveraging actions through SAARC institutional mechanisms on changing water availability, food security, and extreme events due to climate change. In his closing remark, Dr Murali appreciated the CRMT meeting and acknowledged that lots of great ideas came out of the three-day meeting, and urged all to put these ideas to work. He noted that going forward the policy/practice engagement strategy and plan, not to mention the communication and outreach strategy, would be key. He warned that work needed to progress at a faster pace as the mid-term review is coming up. Last but not least, he thanked the organisers of the meeting and also all those who had turned it into a fruitful meeting through their active participation.